Antiques restoration refers to either the practice of "restoration"- restoring an antique or work of art to a like-new condition (or what might be perceived by a viewer or potential buyer as like-new), or "conservation"- the practice of preserving an antique or work of art against further deterioration. Restoration can be as simple as light cleaning to remove disfiguring dirt or grime, such as on the surface of a painting, or it may include near complete rebuilding or replacement, as might be the case with old automobiles or furniture. Often done in preparation for sale, or by a collector upon acquiring a new piece, the main goal of restoration is to "restore" the original appearance or functionality of a piece. There is a lot of difference between restoring and repairing. You may achieve functionality with a repair, but restoring an item properly is an art-form. 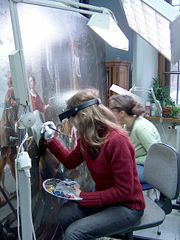 Finishes might/may be stripped and redone, but it is essential that the original patination is retained, if possible. Stripping is only done as a last resort, especially with antique furniture. Engines might be rebuilt with new parts as necessary, or holes in a [silver] pot might/may be patched. While some of these practices are frowned on by many museums, scholars, and other experts, for many people there is little value in an antique that is unusable or undisplayable. Bad restoration is the bane of a trained restorer. Working on someone else's bad repair is the worst possible situation. Restorers have often trained craftspersons, such as furniture makers, mechanics, or metalsmiths. Some have years of experience in their fields, whereas others are self-taught volunteers. Many of the antique aircraft around the United States are restored by trained aircraft engineers assisted by volunteers, some of whom are men who flew those same aircraft years ago. "French Polishing" was the industry standard in Europe during the 18th and 19th centuries pushed aside by the efficient advantage of modern methods in the Industrial Revolution. Lacquers and spray systems replaced the original French polish finish, which is unpractical for mass furniture production due to the labor-intensive process of application. As the desire for antiques was not idle, neither was the need for them to be appropriately restored; thus, the trade has been kept alive by a thread. In contrast, conservation typically aims to preserve the remaining material as being worthy or valuable on its own without necessarily being functional or looking new. There are several criteria for what work is necessary and how far to take any work performed. Chiefly, is the object (book, painting, car, statue, etc.) actively deteriorating? Slowing or stopping deterioration and eliminating or mitigating the root cause is the first task of the conservator. To this end, conservators are usually trained in the science of materials and chemistry, as well as art history, archaeology, and other disciplines related to their areas of expertise. A 13-year-old Australian boy petrified of water is being hailed a hero after he told rescuers to save his little brother before himself, sacrificing his own life to the Biblical floods plaguing Australia.